Many accessories for tactical purposes these days are becoming more tacti-cool than anything. What I look for in products for my ARs and other tactical weapons are utility and design that will perform well under pressure and last ages of use. I recently reviewed two products by Twod, a tactical gear and optics company, on my YouTube channel. Since I reviewed both together in that video and since they are intended for the same audience, I figured I would review both here as well. I wanted to bring this company to the spotlight of this blog as they are relatively new to the playing field of rifle accessories but they are playing the game to win and I like to see that. I am always looking for products that can be affordable for the budget-minded shooter (as many of us are) and of the high quality you expect from gun accessory companies these days. 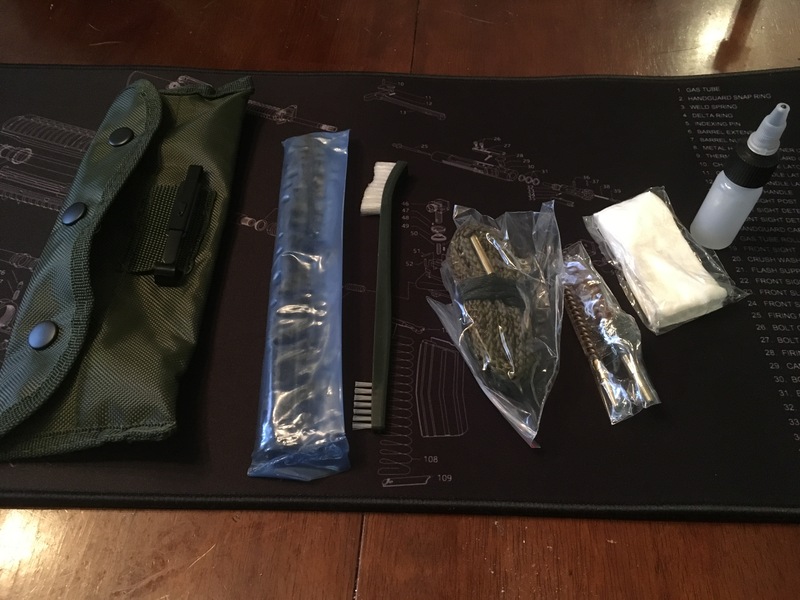 Both the AR-15 rifle cleaning mat and the picatinny rail bipod I recently purchased from Amazon.com met both of these qualifications. First, let’s look at the bipod, as I address on the video first as well. I was able to quickly mount it to the bottom forend rail of my Ruger 10/22 which I have outfitted in a tactical style stock from ATI gun stocks. With a QD (Quick Detach) system, the rail was easy to mount and left me with great first impressions right out of the box. This is an adjustable pivoting mount so it makes it easy to install on any rifle. I had to loosen the QD mount a bit to get it to fit just right but that was no big deal. The legs can be adjusted from 6.5”-9” when deployed or very conveniently stowed back or forward of the mounting plate at a 45-degree angle when not in use. I found the legs stayed out of the way of my rifle handling when they were stowed back or forward. Furthermore, this bipod has a forend grip which is removable, the feet on the ends of the bipod legs are rubber (which prevents slipping and so you won’t scratch up your shooting area) and easily and quickly deployable and adjustable. Overall for the money, this accessory was of good quality in fit and finish. Could you spend more on a detachable bipod? Sure. But do you need to? 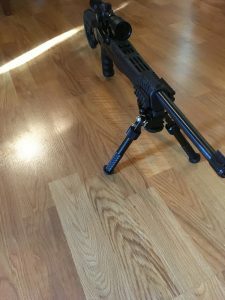 Will this most likely meet your needs of using a bipod for long range shooting? I certainly think so. Check out this product at https://amzn.to/2srZqQD. 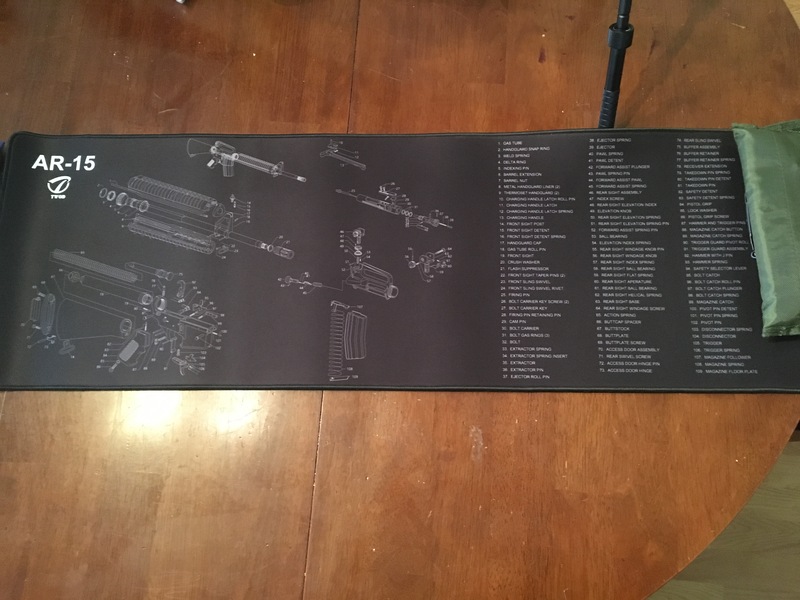 Next on the lineup is something I think every AR-15 owner should own and that’s a quality cleaning mat with an exploded parts diagram of all the parts and pieces of the modern sporting rifle. Not only does this likely keep you from getting kicked out to the garage or outdoors by your wife or significant other for making a mess on the table in the house after a day at the range, it will also help you get “unstuck” if you need help getting your gun back together after disassembly for cleaning. 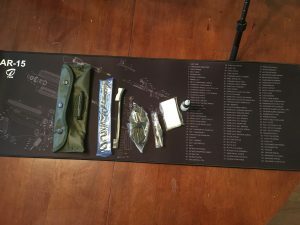 With a 36”x12” surface, this mat will help keep your surrounding area clean and the tools that come in the accompanying pouch are very useful and serve as a “field kit” that is easily portable. These tools are especially selected for black rifle designs but many of them could be useful with many other rifles as well as handguns and shotguns. Now personally, I don’t like to drag out all of my “gun cleaning stuff” every time I sit down to clean a gun so this tool kit really makes my job easy as it has some of the essentials I can use time and time again. The cleaning mat is waterproof, chemical and oil resistant and, most importantly, washable. It even has a rubberized backing meaning you don’t have to worry about the mat slipping away from you while I use. It clings to just about any surface. When not in use, the mat and the tools are simply rolled up together for easy storage. Learn more about this product at https://amzn.to/2HdTQpI. Along with it, I purchased some Hoppes No. 9 solvent and some 6” cotton swabs to aid in my future gun cleaning endeavors. What may be a grueling process for some I quite enjoy and I have always been fascinated on how the modern guns we shoot today, and even those of many decades ago, are designed and assembled. Now both of these products are easy to order off Amazon.com and able to be shipped straight to your doorstep. It’s hard to beat that kind of convenience when selecting your next gun accessories or firearm cleaning supplies. Man I love this stuff! A Long Time Coming… New Video Series Released!